Good evening!! I have had such a great day!! My 9-year old son, Brandon, played in his very first All-star game!! He played centerfield, and made some great catches/plays. He had a great bunt, which unfortunately was the team's only hit! They lost, but he had a great time!! Then, this afternoon, my best friend and her family came over for a BBQ and some swimming!! It was so much fun!! And, to top it all off, I stamped this evening!!! I made two cards for different sketch challenges! (I'll post the 2nd one later!) This one is for Beate's sketch challenge. She is quite an inspiration to so many! You can see her blog here. Be forewarned--her site is NOT good for your checkbook!!! After seeing her creations, you'll "need" it all! I received this RAK from Karen last week, but just now got it scanned!! Thanks so much to Karen for thinking of me! You can see her wonderful blog here. Good morning!! 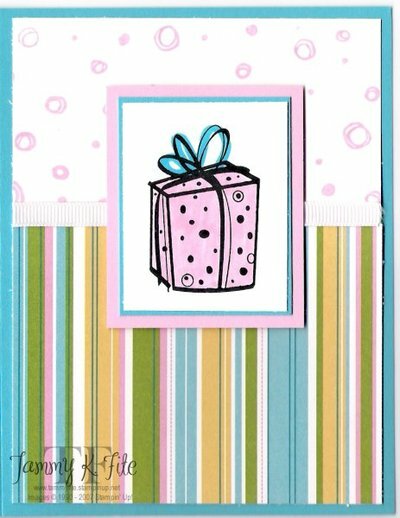 This is a card I'm making for some July birthdays! I have a LONG list of people to send to, so I made up quite a few of these this morning. They were quite easy, but I think they turned out cute!! Ink: Black Stazon; pretty in pink & tempting turquoise Stampin' Write markers; pretty in pink jumbo ink cartridge. As I was browing through all my favorite blogs, I came across "Super Sketch Sunday #18" (seen here ). This is my interpretation!! I started with a 3"x6" piece of Naturals white cardstock, and folded it in half. I layered a 2 3/4' x 2 3/4" piece of Rose Red designer paper (from the Palette o"prints). The two smaller squares are 1 3/4" x 1 3/4". 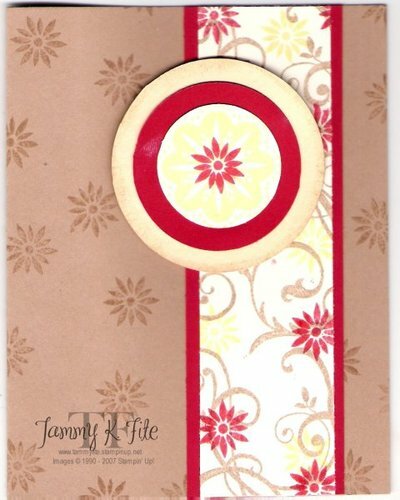 I stamped using rose red and certainly celery ink and the Baroque Motifs stamp set!! I combined two of last week's SCS challenges--the sketch challenge and the color challenge. Colors used were Real Red, Barely Banana & Creamy Caramel. I used my brand new set, "Baroque Motifs"--so fun to use!!! To cut the circles, used the Coluzzle. Hi!! Here is the last card we did for the June Card Club!! And, it's actually my own original work!! haha!! 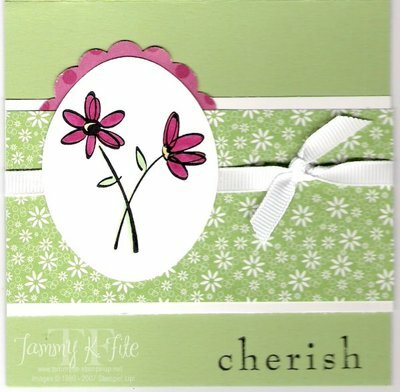 First of all, I have to apologize--i saw a card similar to this, but I can't find it!! I ALWAYS want to give credit to those wonderful artists that share so generously! I will keep trying to find the original card--I will post it when it's found! 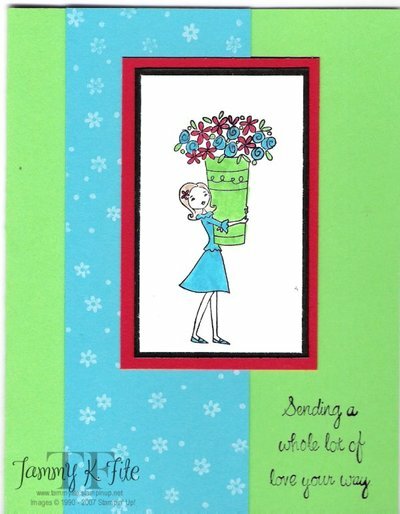 And, if you're the creator of this card, PLEASE post a comment and let us know!! 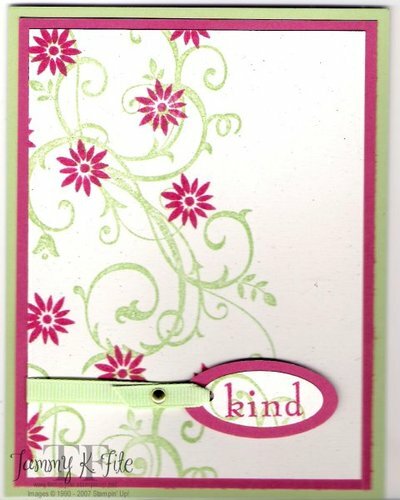 Ink: Basic Black pad; green galore, tempting turquoise, creamy caramel, & real red stampin' write markers. Catalog has arrived in California!!! I can't believe it!!! Some lucky demonstrator in California has received her new Fall/Winter Catalog!!! I must admit--I read all the spoilers, and I can't wait to see my own copy!!! Maybe it'll be in my mailbox tomorrow!!!? If so, you won't hear from me for days!! haha!! Just one spoiler--we have the cropadile!!!! Woohoo!!!!!! 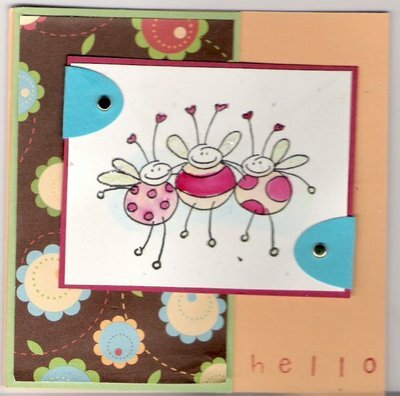 This card was made for the SCS Sketch Challenge SC129. I used the brand new stamp set, Baroque Motifs. (I can't wait for the new catties!!!!!). 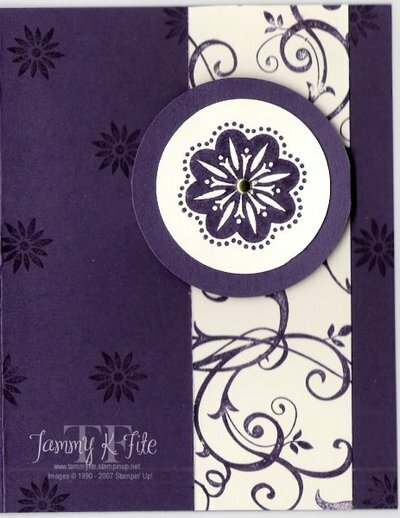 I used Eggplant Envy cardstock and ink, as well as very vanilla cardstock. I used my Coluzzle to cut the circles, and then put a god brad in the center of the flower. VERY simple!! But, that's me--a simple stamper!! haha! !